Today I am releasing another free tool for the community, called PassiveInstall, plus a free online training course for it (see bottom of this article for a link to the training). A PowerShell module intended for use by anyone wanting to create customized automated installations of vendor applications without MSI repackaging, it will be especially useful to those doing Microsoft App-V Sequencing due to the automation support in my AppV_Manage tool that generates PowerShell scripts utilizing the PassiveInstall modules. The purpose of the module is to make it easier to create custom installation and configuration scripts for applications. It makes it much easier to have a PowerShell script that installs things, imports registry files, and make all of the common changes that we want to make. The cmdlets include many specialty commands that simplifies a lot of the painstaking work of writing such scripts in PowerShell, with a few extra that handle situations unique to App-V. It supports the goal of producing the best featured and performant application that is possible without re-packaging the vendor installer. PassiveInstall replaces the original SilentInstall scripting that proved too cumbersome to many because it tried to do too much. The AppV_Manage tool version 5.9, also released this weekend, switches over to generate scripts compatible with PassiveInstall. You create your initial PowerShell script for a Passive Installation and run it through the sequencer. PassiveInstall should be installed as part of your Sequencer image (it adds no dependencies, so it is safe to add). You then run the initial App-V package through AppV_Manage analyzer and have it generate a secondary script with fixes (see this page for details on the types of fixes offered). You then go back to the sequencer and package the app again by combining the scripts. Hey, it’s just PowerShell so work with it as you like. Even if you intend to deploy natively, you might consider sequencing and producing automated fixes via AppV_Manage and then running the combined scripts as you installation job without App-V.
At The Learning Site @ TMurgent we have an online course to help get you introduced to the PassiveInstall tool. The online course if free, and will show you how to install the module, how to learn more about each of the available cmdlets, and a lab that you can perform on your own to create your first customized installation script. We also show the integration with the AppV_Manage tool to automatically generate an improvement for a vendor application. 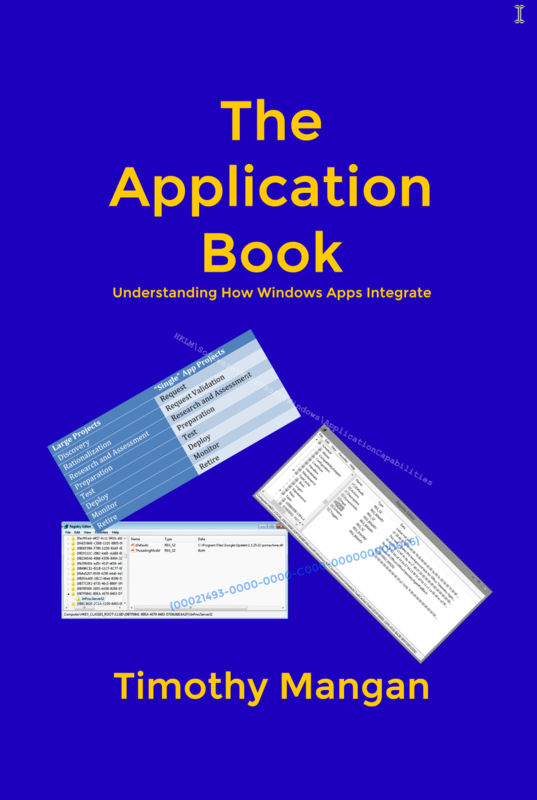 The Application Book is a great book that was written by Tim Mangan for the IT Professionals that deal with installing and customizing applications and desktops. The book is a sort of reversal of the Windows API; relating the artifacts of installation that you find when running an installer to understand the purpose of what the vendor was trying to do. You can find more information about the book and purchase a paperback book or e-book from the website as well. Anyone doing involved with application delivery in a Microsoft environment needs this book!